Enterprising People: Reservation Team Manager Chad H.
Enterprise Holdings has a rich and distinctive connection to the military through its founder, Jack Taylor, who served as a decorated Hellcat pilot during World War II. Enterprise continues to support service members and their families in a variety of ways. One of those ways is by accommodating the schedules of reservists like Reservation Sales Representative Rahsaan W., an E5 – Petty Officer – 2nd Class in the Navy Reserve who was on active duty for four years prior to joining the reserve. 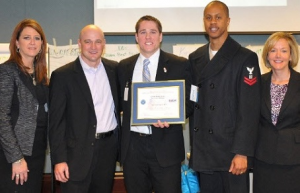 Rahsaan nominated his boss, Reservation Team Manager Chad H. for the Employer Support of the Guard and Reserve’s (ESGR) Patriot Award which is presented to supervisors who support their National Guard and Reserve employees. Some of the ways they can do this is by including flexible schedules and time off prior to and after deployment. Chad began his career with Enterprise in 2010 as a Management Trainee in the St. Louis operations. He underwent a series of promotions before joining the Contact Center in October 2013. In his supervisory rule, he now manages 25 remote employees, including Rahsaan. “I think it’s great that Rahsaan would recognize me in this way, even more so because of what the award represents,” says Chad.